US, 1950, 93 minutes. Black and white. Dean Martin, Jerry Lewis, Mike Kellin, Polly Bergin, Jean Ruth. 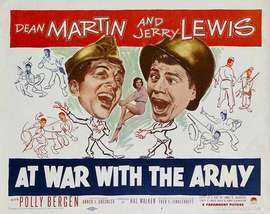 At War With the Army is technically the first Martin and Lewis comedy after their supporting roles in My Friend Irma and My Friend Irma Goes West. The film is of interest in looking at the initial promotion of Martin and Lewis, as individuals and as a team, and in the light of the development of their screen personas. The film was based on a play (and Mike Kellin who portrays the sergeant major appeared in it) which was adapted for Martin and Lewis. Dean Martin portrays the first sergeant, a rather grim, bullying type as well as the romantic type. (People note that Bud Abbott in Buck Privates and In the Navy exercised a similar rather bullying role towards Lou Costello.) Jerry Lewis is Private Korwin, singing and dancing as well as his miming (Martin and Lewis do a very good take-off of Bing Crosby and Barry Fitzgerald singing Toora Loora Loora.) Lewis shows greater versatility, while he does his mugging and miming, he does a range of voices, a female impersonation, and is very strong on slapstick. Martin, on the other hand, while he does get to sing some songs, is rather stiff and stolid. The film shows something of the satire on the army at the time of the Korean War. Hal Walker directed, made a number of the Road films as well as other Martin and Lewis comedies. 1. The impact of Dean Martin and Jerry Lewis as a team in the 1950s? The serious and the comic? Mugging and straightforward straight man? Songs and dances? 2. The film as an adaptation of a play, the staging at the army barracks, in the office, in the mess? The theatrical scenes? The bar? The atmosphere of the US in 1950? 3. The opening, the overview of what was the deadliest aspect of the army – the visuals, bombs and raids, culminating in the sergeant major? Poking fun at the sergeant major, his low intelligence, screaming at people, orders, blowing the whistle, his being deceived in the bar by Korwin dressed as a woman and singing to him? 4. Puccinelli, Dean Martin’s style, Vic and his friendship with Alvin in the past, breaking it in the army, his treatment of Alvin? Telling him to shut up (and Alvin mimicking him)? His work, wanting to go overseas, with the women, Millie, Ruth? His interactions with his officers? His being dismissed at the end? Carrying Alvin’s case? Dean Martin and his songs? 5. Korwin, cooking, singing about the navy and the army having the beans? His wife and the baby? His under Puccinelli’s thumb? The song and dance routines? Going to the bar, disguised as a woman? Alvin and his time at the base, the jobs, cleaning up, put-upon? The complication with Millie? Caldwell and his misunderstandings, the leave to go to his baby? 6. Ruth, the relationship with Edwards, with Vic, the song in the booth, her singing with him? Her coming to the base, the misunderstandings? 7. Millie, her work on the base, her not being bright, her visiting Vic, the devices for Vic to avoid her? With Caldwell? The truth, pregnant, married, wanting Vic not to call? Her happy ending? 8. Caldwell, his role on the base, with his assistants, with Vic, his wife knowing everything and having the information before him? Not knowing at the end? 9. The other men on the base, the supply man and his deals? The people at their desks, the parody of rules and regulation, the colonel and his not wanting the lights on? His notices? The humour at the expense of army routines? 10. In retrospect, Martin and Lewis and their styles? This film as the beginning of a seven-year successful story? And the break-up which followed? And their separate careers?